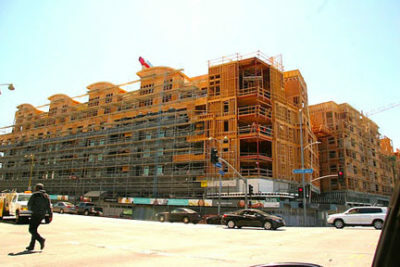 THE BRE development at Wilshire and La Brea is just one example of recent changes to the Sycamore Square neighborhood. Following on the heels of its neighbors, the Sycamore Square Neighborhood Association is poised to start the process to protect its area from McMansions. The group’s board voted last month to look into an Historic Preservation Overlay Zone (HPOZ) to prevent further tear downs of single-family homes to be replaced with ones too large for the lot, overshadowing neighbors. The board also voted to apply for an Interim Control Ordinance while waiting for zoning protection. The HPOZ is already in place in Hancock Park, Windsor Square and other local neighborhoods. Attending the April 12 board meeting were Council District Four candidates Carolyn Ramsay and David Ryu. “They were both supportive of neighbors’ concerns about mansionization and our investigation in to an HPOZ,” said Ann Eggleston, president, SSNA. In addition, Ramsay said she would support additional preservation tools for neighborhoods like Sycamore Square and South Hollywood which have mixed zoning patterns but an overall consistency in the age and style of the buildings. The boundaries proposed for Sycamre Square’s historic district are Sycamore, Orange, Mansfield and Citrus. “Most of the buildings are original with few changes except for two recent mcmansions (and a possible third on Citrus),” said Eggleston.